Bob The Builder is a colourful kiddy ride based on the popular children's television series character of the same name. The mold is in the form of Bob's yellow bulldozer, and features a figure of Bob himself climbing into the seat to greet the child. Also included is Pilchard, Bob's trusty feline companion who features here in the mouth of the shovel. Bob The Builder is a colourful kiddy ride based on the popular children's television series character of the same name. 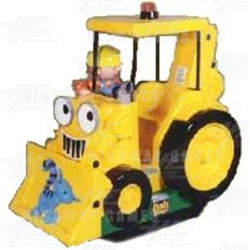 The mold is in the form of Bob's yellow bulldozer, and features a figure of Bob himself climbing into the seat to greet the child. Also included is Pilchard, Bob's trusty feline companion who features here in the mouth of the shovel.